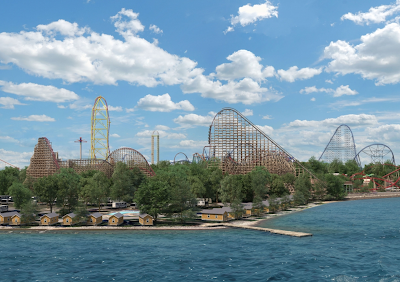 The announcement that Cedar Point fans have been waiting more than a year for has finally happened, Steel Vengeance will forever change the park's Frontier Town when it opens in 2018. The highly anticipated transformation of Mean Streak into a Rocky Mountain Construction designed hybrid roller coaster, featuring new steel track, will dominate riders with a plethora of exciting statistics and records. Steel Vengeance will feature larger than life features, starting with a lift hill that climbs to 205 feet above the park. The first drop will plunge riders down at 90 degrees, true vertical, 200 feet at 74 miles per hour. The additional height (Mean Streak stood 161 feet tall) allows Cedar Point to claim the title of first hyper hybrid roller coaster ever. Features of the 5,740 foot long track include the "world’s fastest airtime hill ever created on a hybrid roller coaster" at 73 miles per hour, a 116 foot outwardly banked air-time hill, and a total of four inversions. The inversions include a 450-degree barrel roll, a first-of-its-kind Twisted Snake Dive, a corked barrel roll and a zero-gravity roll. 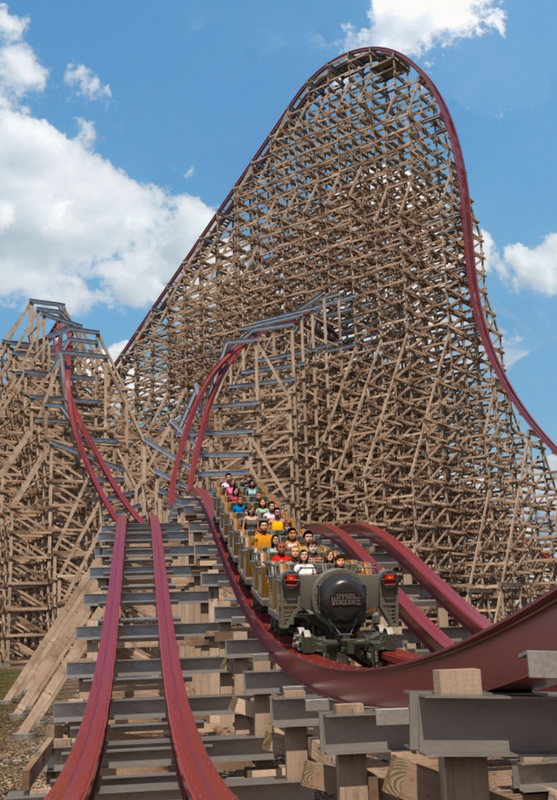 Riders will be treated to a monumental amount of air-time while on Steel Vengeance, totaling 27.2 seconds in all - according to the park this will be the most air-time on any coaster, anywhere. The coaster will utilize three trains that provide a 2 minute, 30 second ride for a total theoretical hourly capacity of 1,200 riders. Control systems for Steel Vengeance will be provided by Irvine Ondrey Engineering, their first project at Cedar Point. 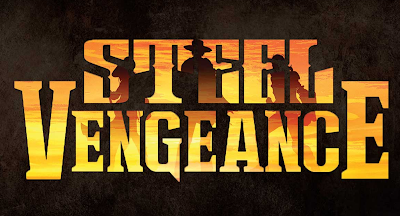 According to the park, the back story of Steel Vengeance "will be told through three new outlaws who have banded together to “unsaddle” the reign of Maverick, FrontierTown’s low-to-the-ground, double-launching roller coaster." 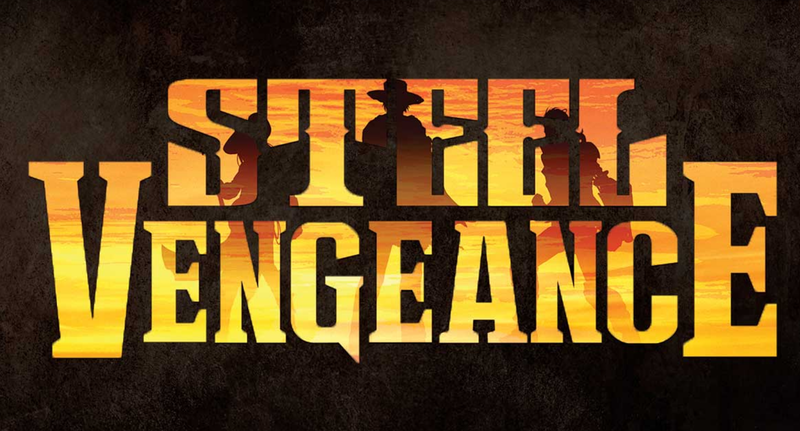 The outlaws include "Jackson “Blackjack” Chamberlain, Chess “Wild One” Watkins and Wyatt “Digger” Dempsey." The park promises to reveal more about these characters as the opening of Steel Vengeance draws closer. This birds-eye view animation of Steel Vengeance gives a nice idea of both the dominating size of the attraction, along with some of the elements previously discussed in this story. From start to finish, this coaster promises to thrill riders with one extreme element after another. If you're ready to take a spin on Steel Vengeance, check out this point of view animation!